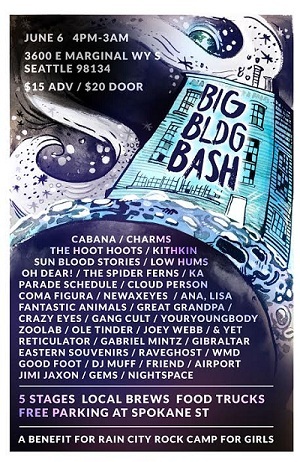 Here’s the first look at artists confirmed for this year’s 2015 Big BLDG Bash, which will happen Saturday, June 6 at a large green warehouse underneath the interchange between 99 and the West Seattle bridge. Additional details and performers will be announced later in the year, but this will give you an idea of what to expect. You can read more about the event in our preview.